PORTLAND, Ore. (June 9, 2015) – The annual meeting of Northwest pear growers was conducted last week in Portland, with anticipated projections on the 2015 fresh pear harvest set at nearly 20.4 million standard box equivalents which equates to approximately 451,000 tons of fresh pears. The projection is 2% higher than the five-year average, and 2% lower than last year’s crop. The estimate was collected from fresh pear growers in Wenatchee and Yakima, Washington and Mid-Columbia and Medford, Oregon growing districts. With relatively mild winter and warm spring conditions in the regions, harvest is expected to be five to seven days earlier than last season, beginning in late July with Starkrimson, followed by the Bartlett harvest in early August. 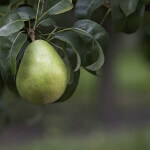 Anjou, Red Anjou, Bosc, Comice, Concorde, Forelle, and Seckel will be picked from late August through September. With no major frost issues, crop quality is expected to be excellent with good fruit size for the domestic and export markets. The top three varieties produced by Northwest growers remain the same as in previous years; Green Anjou pears are anticipated to make up 54% of the total 2015 crop, and Bartlett and Bosc pears are expected to yield 21% and 15%, respectively. Green Anjou pears are showing a projected crop decrease of 1% compared with 2014, but 1% above the five-year average. Bartlett pears are expected to decrease by 7% compared with last season’s results, with a crop yield of 1% increase over the five-year average. Growers anticipate that the Bosc pear crop will increase 5% over the 2014 harvest, or 4% higher than the five-year average. The size of the Red Anjou pear crop is expected to decrease by 4% from last year, but remains up 4% compared to the five-year average. Harvest of certified organic pears in the Northwest is projected to make up about 5% of the total with 974,115 standard boxes (21,430 tons) for the 2015 harvest, a decrease of over 11% when compared with a strong 2014 organic crop, but still a healthy 8% increase over the five-year average. Bartlett and Green Anjou are the two most abundant organic pear varieties, with Bartlett estimated at 301,500 organic standard boxes, and Green Anjou projected yield at 377,000 boxes for 2015. As the new season begins, the domestic marketing team is gearing up for programs designed to increase consumption and awareness of fresh pears. The Pear Bureau will continue an aggressive print advertising campaign focused on educating consumers to “Check the Neck” to know when a pear is ripe and ready to eat. The Pear Bureau’s website will have a fresh look for the new season, with a greater spotlight on recipes and digital resources to help consumers enjoy all 10 varieties of Northwest pears and explore versatile ways to use them. An integrated PR and communications program will continue to enlighten consumers on the nutritional benefits and culinary uses of pears. With 91% of all Americans (1) reportedly snacking daily, PBNW will begin a new multi-channel program sharing simple ways to enjoy pears as a healthy snack. The Pear Bureau will continue to use its comprehensive, proprietary pear category data to custom-tailor merchandising and promotional plans for retailers nationwide. New digital and web-based resources and training will be added to usapears.org to support retailers and wholesalers in the new season. “We have great success showing retailers how small changes in their fresh pear buying returns strong results at their cash register. By collaborating on attainable goals and objectives, we help retailers and wholesalers improve their pear category performance,” Moffitt said. For the 2015-16 season, the Pear Bureau will conduct export promotions in 36 countries worldwide, with fourteen international marketing representatives coordinating promotions for USA Pears with both consumer and trade activities targeted for each country’s market. Focus will continue on the top export markets for USA Pears including Mexico, Canada, Colombia, and the UAE, as well as China and India, which remain two of the strongest growth markets for the industry. The Pear Bureau is also prepared to reintroduce promotional activities in Russia—a former top three export destination—should the market reopen to U.S. exports. Key activities for the season include continued partnership with movie studios Fox Pictures and Universal Pictures for joint promotions in Latin America, where USA Pears are featured using images from kid-friendly movies like Penguins of Madagascar and Minions through billboard advertising, consumer contests, and in-store promotions. The Pear Bureau will also extend PMA’s “eat brighter!” Sesame Street campaign into its Mexico in-store activities. Also in Mexico, the Pear Bureau’s proprietary pear category data system continues to provide insight specific to the Mexican market and allow for season-long marketing programs to be customized for each retailer. A joint promotion with the children’s television program LazyTown will be conducted in Colombia, Costa Rica, the Dominican Republic, and Guatemala. Chinese New Year-themed activities in major cities in China will continue to promote USA Pears during a key promotion period. Also in Asia, the Pear Bureau will launch a new social media activity in China and India.